PocketWGU | The Unofficial Mobile App for WGU Students. PocketWGU is the unofficial mobile application for use by students of Western Governors University. 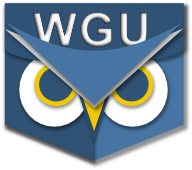 Created for, and by, the students of WGU, this app provides access to the online communities, learning resources, and student program information of WGU. PocketWGU is available for iOS (Phone & iPad), Android devices (phones, tablets & Kindle Fire), and on Windows Phone. PocketWGU is free and does not contain ads. Well folks, it's been a good ride. Due to some recent changes in WGU systems, I'm afraid that PocketWGU is no longer working. In that I no longer have access to a functioning test account, I don't think I'll be able to fix PocketWGU this time. There's always some hope that I might be able to revisit this later, but for now, PocketWGU is effectively dead. I'll be removing it from the various app stores over the coming days. Available now on the Google Play and Amazon App Stores. This release updates a bunch of the supporting libraries to current releases and fixes a number of bugs related to display of the videos list. It also tweaks the accountability badge for readability. Fixes bug where WGU videos played audio-only (no picture). Available now on the Google Play and Amazon App Stores. This release fixes a bug where playing/downloading videos would only provide audio, with no picture. Enjoy! Important note: We strongly recommend that you uninstall the old version before installing the new release from the app store. It should save you some headaches. Some PocketWGU users on iOS have been experiencing crashes (starting around 4/27) retrieving their degree plans. I've submitted an updated version for iOS to Apple (yesterday) for its review, so hopefully this will be fixed as soon as they release it. You may need to uninstall version 2.1.0 before installing the new version 2.3.0. Sorry for the inconvenience. Today marks the fifth year since PocketWGU was released to the WGU Community in its first (very beta) form. Over fifty three thousand users later, and still going strong. Thanks All! Bunch of new features, major optimizations for speed and offline access. Enjoy! Available now on the Google Play and Amazon app stores. Version 2.2 includes a complete rewrite of the Degree Plan and CoS (aka Studyplan) systems for speed and for offline viewing.